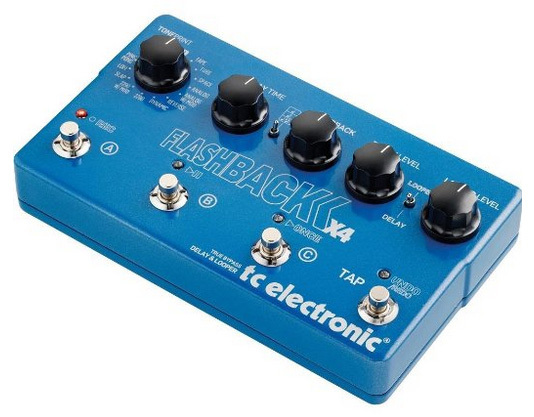 Home Nice Deal on the TC Electronics Flashback X4! Was stumbling around this afternoon, and came across a pretty sweet deal that some of you guys might be interested in. The deal is on the TC Electronics Flashback X4 delay! In a nutshell, the TC Electronics Flashback X4 is basically 4 TC Electronics Flashback delays in one enclosure. Additionally, there is a 40 second looper with undo function included into this pedal. The Flashback X4 also comes with 15 different delay types. The Flashback X4 Delay & Looper combines four Flashback delays plus a 40-second looper with ‘undo’ function into one amazing pedal that takes delay to a place it has never been. TC Electronic made sure the Flashback X4 delivers the legendary TC quality at every turn. From the awesome digital 2290 sounds to beautiful analog tape echoes and more exotic vibes of a reverse delay, it contains virtually every delay sound under the sun – past, present and future. It’s even equipped with four TonePrint slots that can be loaded via smartphone or USB port. This cornucopia of delays also allows players to switch between three customs presets that can be as different and varied as they need them to be. The tap tempo allows you to easily set delay times, sync up with a drummer, or match delays to your guitar rhythms or solo ideas without taking your hands of the guitar or bending over the pedal. Simply tap the tempo with your foot and get on with things! It also allows for MIDI clock sync – perfecting delay times to your exact wishes. You can change presets and control X4 externally, for example if you wanna have it in a rack or safely in your backline. In Flashback X4, the delay engine is completely separate from the one handling looping so there is total dedication to the sound you want to get and the cool ability to add delay to your loops. Flashback X4’s total dedication to delay shines brightly in the expression pedal input. Many guitarists dream to have direct control over delay parameters and Flashback X4 gives you exactly that. But it’s just not one parameter you can control, you can choose to control either the delay time, the feedback or the delay level of your sounds, giving you unprecedented control. Whatever your set-up or situation, Flashback X4 can adapt and guarantee optimal signal integrity – via small dip switches, Flashback X4 can be set to either True Bypass or Buffered Bypass. Okay.. let’s talk about the deal. The TC Electronic Flashback X4 lists at $369 and is usually available for $250, but is currently on sale for only $200.93 on Amazon.com and includes FREE shipping. So that’s basically $50 off the going rate for this. Not bad! If you own a TC Electronic Flashback X4, let us know what you think about it by commenting below! Nice Deal on the TC Electronic Flashback Delay Nice Deal on the TC Electronic Ditto Looper TC Electronic Flashback X4 Great Deal on the Way Huge Aqua Puss Delay at Amazon! Screaming deal on the BBE Green Screamer!